I’m not even joking when I say this, but there actually is a cookies & cream flavored oreo. It tastes exactly as it sounds… like an oreo. An overpriced package of oreo which means they’re good for the weirdest reason. One of the first strips on the page was about oreos almost one year ago today! Banana Split Flavored Oreo. So here’s our package of the oreo flavored oreos. See they exist, I’m not crazy. Here’s to this weeks review. Gekkan Shoujo Nozaki-kun is one of those comedy animes that should be boring and generic, but unfortunately doesn’t want to be that. I thought this would be a lame comedic romance anime with a bunch of puns thrown in with a romance that doesn’t go anywhere. Of course some of it is true, but let’s continue on below to see what Gekkan Shoujo had to offer. 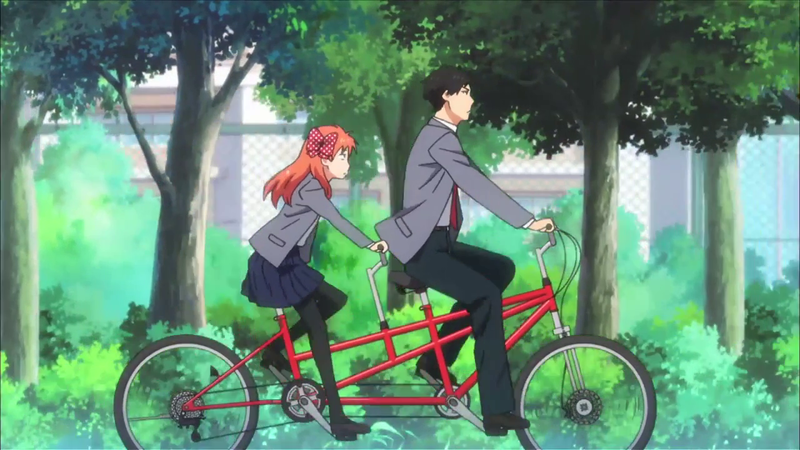 The show starts off with our two main protagonists Chiyo Sakura a young 16 year old high school girl who attempts to tell her crush Nozaki that she has been in love with him since the first day of school. 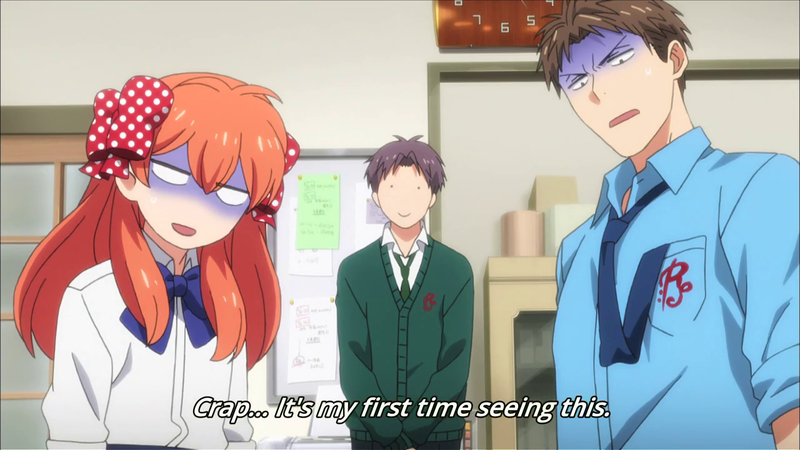 Chiyo being a very shy girl messes up telling Nozaki that she is his biggest fan instead of admitting she loves him. Upon this confusion Nozaki hands Chiyo an autograph in exchange. On the autograph it is addressed from Nozaki, but the name Yumeno appears on the side. Chiyo being intrigued discovers that Yumeno is the same name of a popular Shoujo (girl romance) manga. 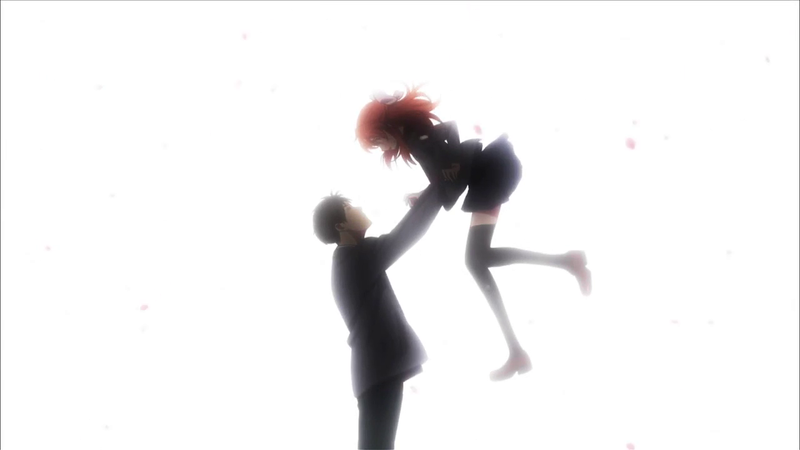 The tall cool Nozaki is the artist/writer for a popular girls manga. When Chiyo discovers this she becomes a beta painter for Nozaki after seeing a painting she did for her art club. 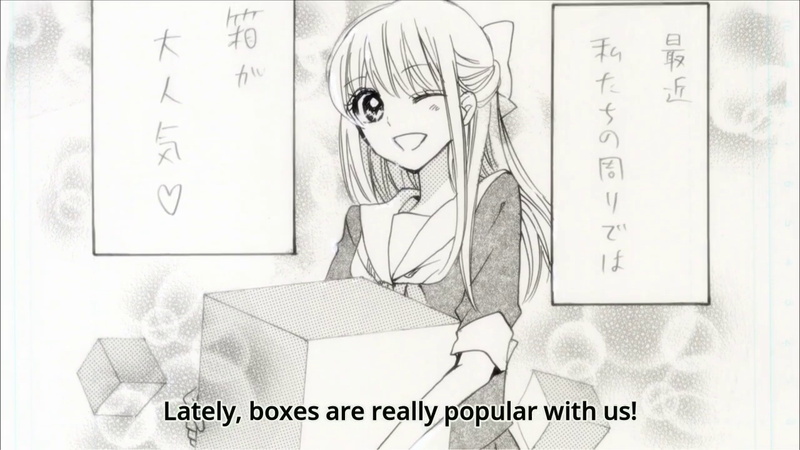 Where does that put Gekkan Shoujo Nozaki-kun in the spectrum of humor? In all honesty I might say weird. A lot of the jokes in this show are the same types of jokes I use for JODDAS VAPD and that’s probably why I like it so much. I don’t think there was an episode that didn’t make me laugh or smile at all in the series. It mostly focuses on its humor more than anything. The romance aspects mostly come off as very cute and occasionally very sweet. 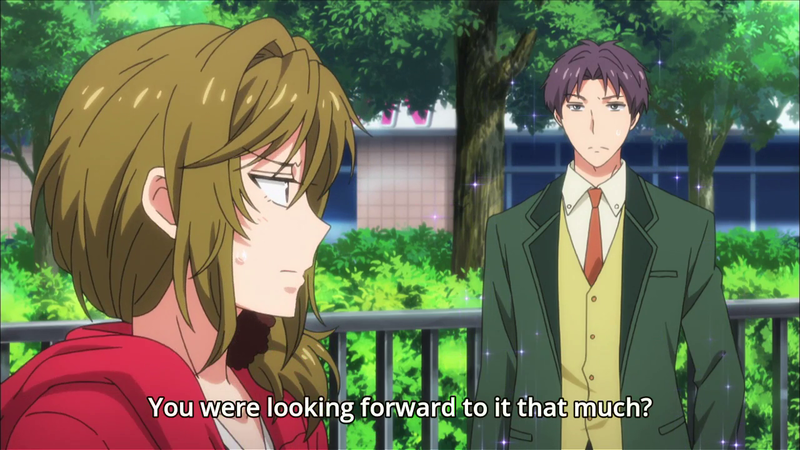 I think a good example of this is when Nozaki is trying to come up with a way to make a surprising romantic moment. While attempting to do so Nozaki hangs around Chiyo all day doing surprising things like giving Chiyo a bento that appears to have only rice, but secretly has curry under all of the rice. So at the end Nozaki wants to walk Chiyo home, but Chiyo is still expecting a bunch of surprises, but it just turned out Nozaki just wanted to spend time with Chiyo in the end. I feel that’s a perfect combination of humor and romance. I want to go back more into the series humor. There are moments in this series that are so hilarious to me, and the sad thing is they aren’t actually original. Even though I know it isn’t original it’s written and created like it was fresh. I think a good example is the relationship between Waka and Seo. Seo is kind of an evil delinquent girl and Waka is an under class man who despises her. However Waka is enticed with a member of the glee club simply known as Lorelei who he listens to whenever he’s feeling especially annoyed by Seo. In reality Seo is Lorelei, but her outer image would never suggest such a thing. Waka being fed up with Seo decides he should draw inspiration from reading shoujo mangas to come up with a way to make Seo feel down. This all completely back fires in what I think is one of the funniest moments of the series when most of his actions end up doing the opposite effect. Too add insult to injury however, Nozaki is using this miscommunication as inspiration to use in his manga series. The other thing that helps this series seem fresh is the lack of cliches and troupes. No fan service is present in this series. I like that there isn’t some random beach episode or a hot springs episode. Some scenarios are obviously cliche though, but I swear this series just pulls the middle finger on completing the cliche as much as possible. Kashima is a tall girl that all the girls in school love because she looks more like a slim handsome man. Kashima however has her eyes set on Hori-sempai a member of the drama club who’s far shorter than Kashima, and occasionally beats on her. Which I think is different can comes off very humorous and a weird romance. The thing that really helps this series out a lot in my opinion are all the characters. It’s important for an anime series to have likable characters in a show. To me there’s not a single character I hate in this series. Every character is interesting and every character is funny. Even minor characters are great, and it helps that they remain MINOR unlike Nisekoi trying to make every character a part of the story. I love how important each character is to Nozaki and Chiyos life and makes them feel that much more important to the plot. 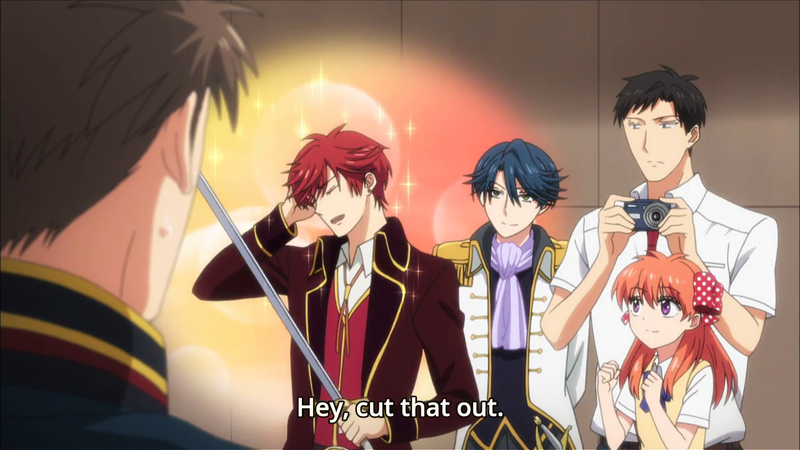 Nozaki is the coolest male protagonist I’ve seen in awhile. He’s very similar to the producer from Idolm@ster Cinderella Girls, but is not only blunt but possibly naive as well. Chiyo is the cutest female protagonist I’ve seen in awhile. Even though she has probably the blandest character design ever, but everytime she’s on the screen the scene brightens up. I’m not sure there’s a lot of negative things to say about the series that isn’t just nit picking. I will say that the quality drastically drops after the first two episodes, but for a series that is mostly slow paced anyways do you need high quality animation/detail all the time? There’s also the constant repeating image of art supply which gets kind of old. Finally, you can predict the ending of the series from a mile away, but honestly who cares as long as getting there was fun. 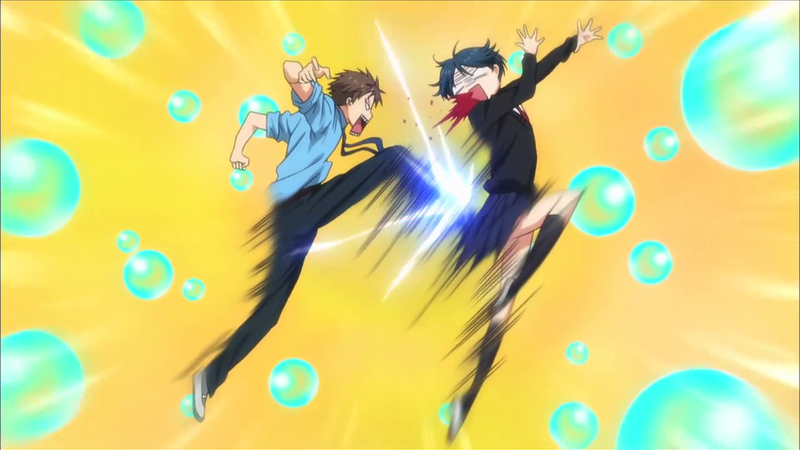 If you like comedy Gekkan Shoujo Nozaki-kun is totally worth the watch. It’s fun, weird, and charming in one 12 episode series. There’s a character to like for everyone and almost everything in the series feels fresh. I have a hard time thinking of anything bad to say about this show. Check it out! Final thoughts: The MANLIEST romantic comedy in awhile. I really enjoy making strips and I want to continue the best works I can for you the readers. 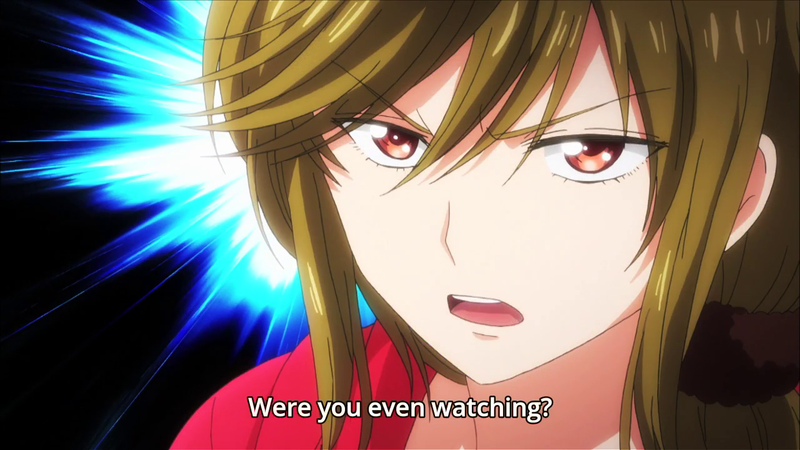 This entry was posted in Dan and tagged Anime, Food, Gekkan Shoujo Nozaki-Kun, Inception, JODDAS VAPD, Movie, Oreos, Parody, Review, Shopping, TV Shows on July 11, 2015 by koreantacos. I swear, every trip to the grocery stores junk food aisles is like walking through Wonka’s Chocolate Factory, Candy Land, and Munchkin Land. Every time I go to the grocery store I discover something new. I will spend a long time pondering in my head how some of today’s food products got the seal of approval to exist. The biggest offender for me is Oreos. 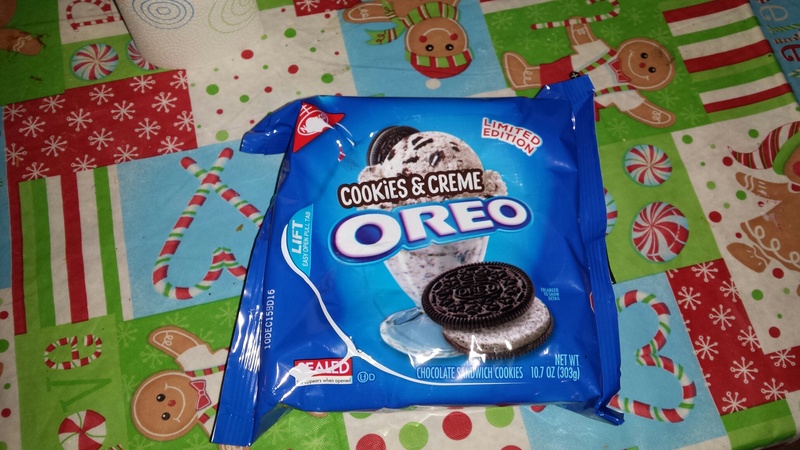 I don’t even really care for Oreos, but tell me there’s a Blizzard Oreo flavored Oreo, and I will rush to the nearest grocery store to hunt it down. I have chomped down: lemon, mint, marshmallow, berry smoothie, birthday cake, cookie dough, raspberry, and even fruit punch flavored oreos. I am always intrigued by unusual snack designs. Just so you know banana split flavored oreos don’t exist, but damnit they should! Update: Since making this strip it was discovered that there is in fact an Banana Split Flavored Oreo. This entry was posted in Alice, Jen and tagged Comic, Cookies, Diet, Food, Humor, JODDAS VAPD, Oreos on July 15, 2014 by koreantacos.